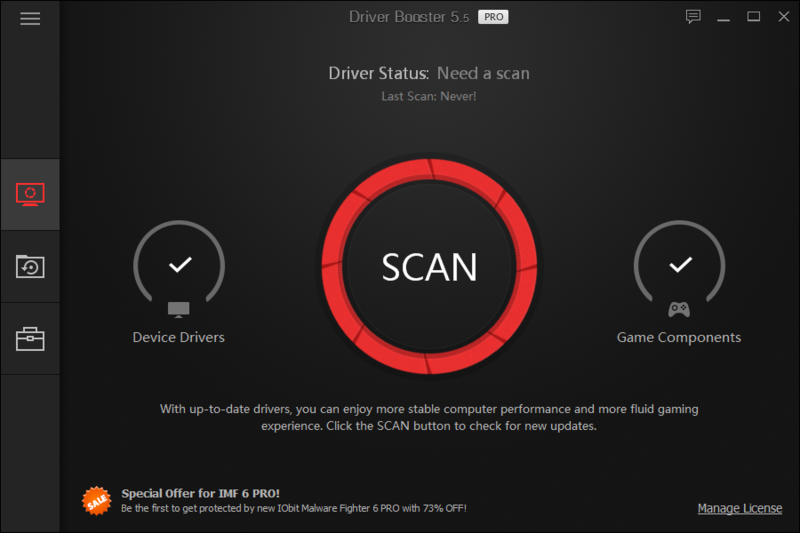 Driver Booster Pro 5.5 was available as a giveaway on July 8, 2018! Don't use it the drivers are 3rd party and your PC will not work. If you do be sure to create a restore point and then uninstall this so-called Driver Booster. I use Driver Easy now for 5 yrs. and yet to have a problem and its FREE. Rental ware garbage...will cause more issues than it will fix...especially if you don't know what you're doing...which seems to be almost everyone here. If it isn't broke...don't fix it. I have used many of these driver updating programs and none come anywhere near this one. I had a driver that was missing on my PC that none of the others found. But not only did this program find the missing driver it also installed it automatically for me. I was so impressed with it I ended up buying the Home Pro Version. Plus if you decide to buy it. It's a one off purchase that gets you a lifetime license and updates. Plus don't forget to get Driver Talent For Network Card while your at it. This program allows you to download and install network drivers without an internet connection. Once you are connected to the internet using this program then use Driver Talent to download all your drivers. Nothing could be more simpler when you have done a fresh reinstall of Windows and have no drivers or a drivers CD. Seriously Peeps, if you want the best Driver Updating program that does everything for you. Then you can't go past: https://www.drivethelife.com/free-drivers-download-utility.html I have used many of these driver updating programs and none come anywhere near this one. I had a driver that was missing on my PC that none of the others found. But not only did this program find the missing driver it also installed it automatically for me. I was so impressed with it I ended up buying the Home Pro Version. Plus if you decide to buy it. It's a one off purchase that gets you a lifetime license and updates. Plus don't forget to get Driver Talent For Network Card while your at it. 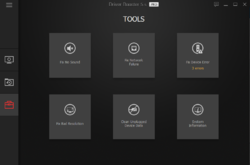 https://www.drivethelife.com/user-guide-to-download-network-drivers-offline.html This program allows you to download and install network drivers without an internet connection. Once you are connected to the internet using this program then use Driver Talent to download all your drivers. Nothing could be more simpler when you have done a fresh reinstall of Windows and have no drivers or a drivers CD. Got a 404 on link provided at my email. Disgusting! I installed on Windows 7 Home Premium and had no issues. Ran once, let it do it's thing and everything is still fine. Why's this program taking an hour to install? Kernel Klink, Your system was fighting it, probably because of something running in the background. My older Dell notebook ran in a few minutes. You may want to try again from an email link. RonF, Thank you. I forgot about it and came back hours later and it was at 70% so I cancelled it. Thing poped up saying successfully installed. Entered license code and it works! joseph parke, Look for the README file that downloaded with the ZIP. Open it an copy the registration code to the clipboad. Run the program and look for the option of the bottom right corner to enter the registration code. Use Ctrl-V to paste it in the space provided. You'll see the program update to PRO. You'll probably have to do this before the promo expires. It worked flawlessly for me. Hope this helps. 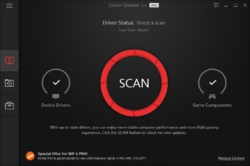 I've been using Driver Booster Pro for many years on several computers and it has always worked flawlessly with no problems ever. 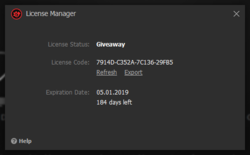 To all those crying that this is a "lease" and not free software because the lease expires after a while, get used to it. All software is going this route, especially good software that requires constant updating and tends to get pirated i.e. see Adobe creative suite. This is a great product from Iobit and I trust all their products. Does anyone know if there is a way of keeping the download that the program does? Think that if I have to rebuild at some point it will be handy to have the driver packages on a thumb-drive or other backup source to reinstall. Beside knowing the map, where the dwonload are placed, you also change a setting. "Automaticallu delete installed driver packages"
HerbA, "keeping the download" Beside knowing the map, where the dwonload are placed, you also change a setting. "Automaticallu delete installed driver packages"
Ootje, thanks. I plan on copying the files out manually so I have them for future use if ever needed. HerbA, Yesterday I used the program on a new Win10, 1 day old and laptop 10 years. And 15 updates and all installed. After that all the updates were gone, because of the wrong setting. And still no sound, no original and not after the updates. Org Windows for that laptop was WinVista32 and now Win10-64 Educational. 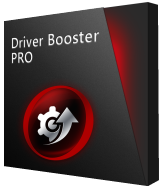 Driver Booster Pro est un très bon logiciel pour la mise à jour des pilotes. J'utilise ce logiciel depuis longtemps, il est fiable et son utilisation est simple et rapide. Driver Booster Pro est un très bon logiciel pour la mise à jour des pilotes. J'utilise ce logiciel depuis longtemps, il est fiable et son utilisation est simple et rapide. MERCI. Installed without incident on Windows 7 Home Pro. Perfect timing, my license had just run out on the om Driver Booster 5.9. Thaks, GOTD. 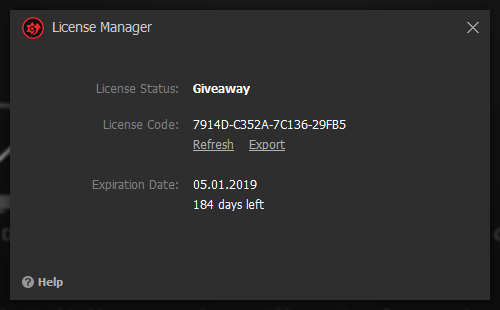 If you have version 5.2 from the January 2008 Giveaway just install and click the Pro button on top and enter the new key. Otherwise you'll have 8 day's left. vince brennan, I respect your opinion but this time it's wrong. vince brennan, Making the Microsoft S into a dollar sign has been so overdone, that the International Clichés Commission has banned it. Jim C, Microsoft has screwed up my system with updates more times that I can count. Why are you then thanking GOTD for the offering ? Tobiasson, It's called manners. I thanked GOTD out of courteousness and respect. In the same way if someone offers to give or sell you something. You reply, "thank you, but no." Also if you'll notice, I didn't thank iOrbit! MG, you must be using Win 10. All the other versions, you can back out of Micro$oft updates and restore the old. Myself, like the fans that are still using XP, I'll hold on to Windows 7 Pro 64 bit well into the 2020's. Then it's on to Linux! That ball of mess, Win 10 will never be on anything I own. I'm not handing my privacy rights over to Micro$oft!!! martin, the second entry pops up a new box to enter the key and it worked fine. Peter Blaise, I just checked by running Autoruns but I'm not seeing all that. Context handlers and Drivers, sure, but they aren't active on their own. I un-click the Task Scheduler entries when I install and they stay that way. I can't see why you'd have to run Autoruns after every use?? Download the trial from their website and insert the key in lower right corner, it will activate. ken , I only received a download link - where is the key? RedHeights, The key is in the readme.txt file in the same place as the setup.exe. I've used the freeware version of this program before and it was my go-to for solving some driver issues that occurred the last time I updated my OS. This is not something that I keep installed or use frequently, but in the past whenever I've needed it I got good results. The freeware version was always trying to sneak other software onto my machine so be real careful and read the installation licenses closely. ChronicKanuck, MikeR is right in what he says, you obviously missed the point, but you are probably still using a Fisher Price computer which would explain your response. MikeR, I've tried an earlier version of this software and it caused a few problems. Although I haven't bothered to check out the drivers fully, I suspect that many are generic drivers from various unknown sources. I'd seriously take the time and track down any needed drivers from the software/hardware developers, it could save you a lot of wasted time later. MikeR, Agreed, 99.9% the only thing I disagree with is on non windows 10 versions of windows do not accept microsofts generic driver updates blindly. They NEVER tell you anything about why the update is offered, what it fixes, what it adds or removes... especially if your have a branded system like HP or Dell or Asus etc since they may REQUIRE OEM modifed device drivers for the manufacturer specific hardware implimnetations that may use different chipset I/O pins for different functions that the generic WHQL reference drivers will not know about or may use different I/O pins or use the ones your OEM used but for a different purpose. Be prepared that the version Microsoft Update offers is a completely different version branch to your original or latest OEM divers or official WHQL signed drivers from NVida. If a device does not work right or a game demands a newer driver then if its worth the effort consider getting the latest version from an official source and not a different OEM's driver package as is often offered by these programs which is a recipie for loss of functionality when it offers a Dell Broadcom wifi/bluetooth chip hor an HP machine which can happen because they match only part of the Plug and play identification data. MikeR, thanks again for your words of wisdom. For any one reading this simply go to "control panel, device manager" and if you see a yellow ? beside any drivers, then you indeed have a problem. If not then your system is working fine and there is absolutely no reason to update any drivers. If you do have a ? beside one of your drivers then download the update directly from the website of your devices manufacturer. Not difficult to do, just google it if you are don't know where to find it. For 20 years I was a huge fan of these types of programs, speed boosters, registry cleaners, system cleaners, etc.... and during all that time I found myself doing a clean install of Windows about every 6 months simply because my system either slowed to a crawl or just became erratically unstable. I stopped using these snake-oil type programs about ten years ago and have only reinstalled Windows once in all that time, and that is after several hardware changes, new SSD, new video card, more memory... etc. The only reinstall I did was after a motherboard upgrade which is a given. If you really want to improve the performance of your system, the only way that is going to have any positive effect is to upgrade your hardware, memory and video card are 2 of the big bottle necks on performance, as well as the motherboard itself if it is more than 5 years old. Really it all depends on what you use your system for... That's up to you. 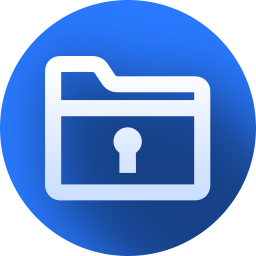 The most important thing anyone can do is to find a backup solution that works for you and to use it on a regular basis, whether that is daily, weekly, or monthly is up to you. Depends on how often you add data that you want to keep. Just follow that routine and you'll always be able to recover most of your data. As has been said before, everything works on your PC as it should, stay away from that kind of program. This has also been said many times by others. As has been said before, everything works on your PC as it should, stay away from that kind of program. Reply | Comment by Hadrianus – 5 months ago – This has also been said many times by others.